Can’t Wait to See Anthropoid, Which Tells the True Story That Sets Lilac Girls in Motion. Can’t wait for August 14th, when we can all see this amazing movie, which shows the true events that lead up to the medical experiments at Ravensbruck Concentration Camp for women, the story behind Lilac Girls. It all started with Operation Anthropoid, when Czech soldiers plotted to assassinate SS officer Reinhard Heydrich, one of Hitler’s top lieutenants and the author of The Final Solution. They mortally wounded him and this is the focus of the thriller Anthropoid. Later, Himmler’s friend Dr. Karl Gebhardt was brought in to treat Heydrich and did not use sulfa drugs. When Heydrich died Hitler accused Gebhardt of killing his friend and Gebhardt and Himmler decided to do medical experiments on healthy Polish women at Ravensbruck Concentration Camp for women to prove that sulfa was ineffective, the story behind Lilac Girls. The Anthropoid trailer alone looks so good and stars the incredible Irish actors Cillian Murphy (Peaky Blinders) and Jamie Dornan (Fifty Shades). 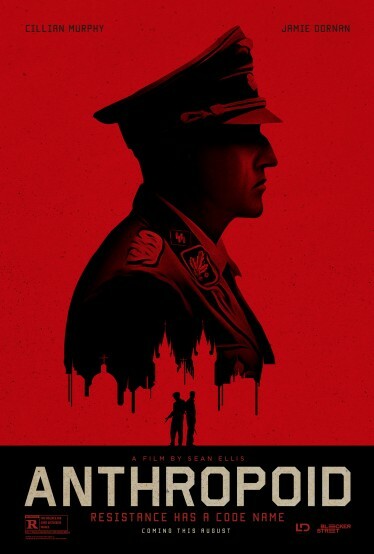 Here is what Bleecker Street Films has to say about their movie: ANTHROPOID is based on the extraordinary true story of “Operation Anthropoid,” the code name for the Czechoslovakian operatives’ mission to assassinate SS officer Reinhard Heydrich. It’s so wonderful this little-known story is finally getting attention. Can’t wait!